I had the privilege of being invited to the launch of the Fashion Forward Pop Up Store at Galeries Lafayette. The buyers at Galeries Lafayette have chosen 7 designers from Fashion Forward Season 5, and their exclusive collections for Autumn/Winter 2015 are now available for sale on the First Floor of the Women’s Department from 30th September to 27th October 2015. The event was hosted by Bong Guerrero (Founder and CEO Fashion Forward) and Michel Abchee (Chairman and CEO of Galeries Lafayette Dubai). “FFWD is committed to supporting regional design talent in all aspects of their businesses, including facilitating introductions to key buyers and leading regional retailers. We are delighted to be partnering with Galeries Lafayette, and thank them for selecting these deserving designers, and for showing such continued support to FFWD. Having Middle Eastern labels recognised and supported by such a huge force in retail shows not only the levels of talent the region has, but also proved the demand from consumers is growing.” – Ramzi Nakad, Founding Partner, FFWD. Two of the seven designers graced the event. I had the pleasure of meeting the very glamorous (and super talented!) Lama Jouni and Daneh at the event. 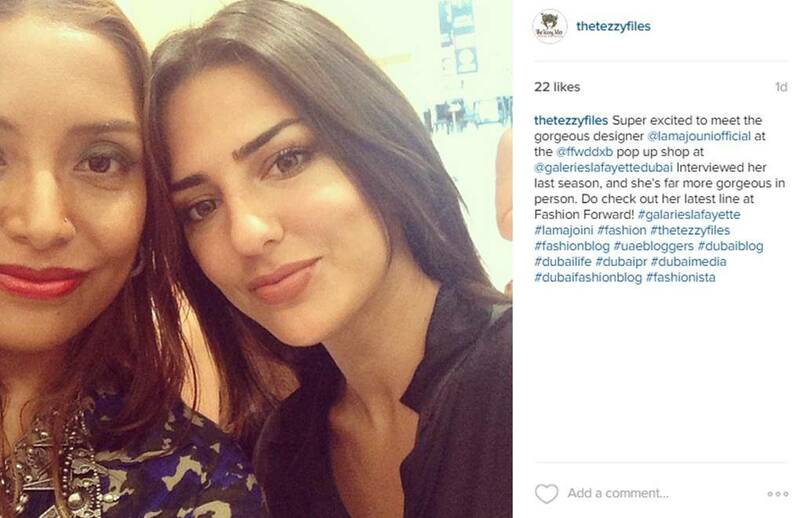 I interviewed Lama Jouni on The Tezzy Files during the last season of Fashion Forward. Click here to read the interview. Lebanese designer Lama Jouni created her eponymous label in Paris in 2013. The A/W ‘15 collection is inspired by the 1970s Rock and Roll era. “My fascination with Bianca Jagger and the cooler-than-cool glamour girls of that era were my muses for the collection. From plunging necklines and high waistlines to long capes with exaggerated shoulders, this collection celebrates women in every way.” – Lama Jouni on her A/W ’15 collection. Saudi designer Daneh Buahmad produces ready to wear collections that are simple and clean cut, but with a twist. The ‘Transition’ collection was inspired by Daneh’s realisation that imperfection is perfection. “Lines are clean and finishing is flawless, yet hems are unfinished and pants are twisted. Fabrics are mixed and colours are neutral, all giving the collection that edgy charm making each item a staple in any wardrobe – but only for those who dare to be comfortably different,” – Daneh. Lebanese designer Aiisha Ramadan revealed her new direction ready-to-wear collection at April’s FFWD. Saudi designer Arwa Al Banawi’s A/W ’15 collection, aptly named ‘Suitable’, features a mix of ready-to-wear shirts and suits that can be bought as a full look or as separates. In an array of bold, bright patterns each piece is designed to make you push fashion boundaries and standout in the right way. French-Algerian designer Faiza Bouguessa made her FFWD debut in April 2015, showing her line of contemporary, luxury Abayas. “The collection introduces a relaxed style with restructured basics for the modern women’s wardrobe. It includes a variety of silhouettes sensibly designed to suit all types of women.” – Bouguessa. Beirut-born Joe Arida is a 27 year-old multi-disciplinary designer who founded his brand LA TERRE EST FOLLE in 2014. “The I-HUSTLER collection is inspired by gang culture and rap music, it references the juncture between sports and street-wear tempered by the purity of white and transparency.” -Arida. Moroccan-born, Said Mahrouf’s love of costume design, artistry and partiality to feminine elegance defines his collections. For A/W ’15 Mahrouf drew his inspiration from paintings by Kazimir Malevich. 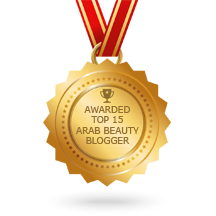 See the exclusive collections for yourself! 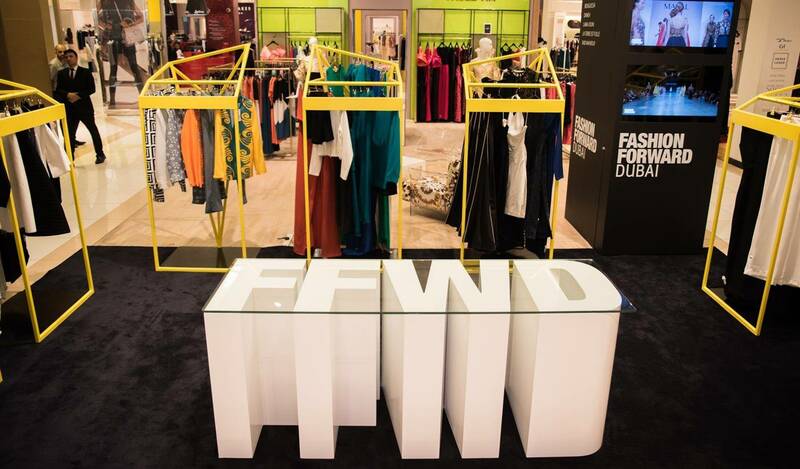 The FFWD Pop Up Store is located in the Womenswear Department, First Floor, Galeries Lafayette, The Dubai Mall, and will be open to shoppers from 30th September to 27th October 2015. From the Catwalk to Your Closet. Posted in Fashion News and tagged arab designers, dubai, fashion, fashion designers, Galeries Lafayette, runways, UAE. Bookmark the permalink. Too Faced Chocolate Bar: Better than Naked?